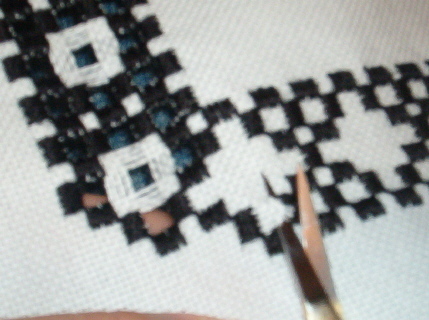 Cutting your fabric in Hardanger is an important step. It takes you from just doing geometric patterns in satin stitches to being able to create something delicate and truly beautiful. You want to wait until you have finished all your Klosters before you begin cutting. If you “cut as you go”, you weaken the overall integrity of the fabric, and you can end up with warping, stretching, and all other kinds of not-nice things happening. very, very, very sharp scissors, with a small pointed blade. I use 4 1/2″ scissors with a 3/4″ cutting area (approximately) – at Joann it’s the packag that says for “delicate” or “fine” embroidery, something like that. I like to use a product that prevents fraying, just for my peace of mind. I use June Tailor’s Fray Block, I think there are other brands available as well. I found it in the Notions section of Joann (can you tell I like that store?). If you do not have Fray Block, I’ll tell you how to fix any accidental snips later – before I used Fray Block, I always had at least one oops per project. A strong hand!!! Especially if you have a lot of cutting to do! Okay! And we start. I am right-handed, so if you are left-handed, you may need to adjust accordingly. Always cut where the satin stitches ENTER the fabric. Put your scissors in the hole the perle thread is poking through. Never cut parallel to a Kloster block – it doesn’t work, the whole piece will fall apart. I like to position my scissors so that I am cutting immediately to the left of a Kloster block, that is, the satin stitches are to the right of my scissors. (See picture that goes with this entry.) As a right-handed person, I find this gives me more control. Pick up one or two fabric threads at a time with the bottom blade of your scissors, bring the point up to the top, and snip (again, see the picture). Keep your scissors as close to the perle threads as possible, but be careful not to clip them! Then pick up one or two more fabric threads, and repeat. Cutting this way gives you much more control over the fabric, and prevents mistakes. Once you have cut all the fabric threads you need to cut, it’s time to remove the clipped threads. You can use your fingers or tweezers to do this. The important thing to remember is to gently loosen the clipped threads before you pull. This will save your fingers from pain and your fabric from warping, stretching, and all those not-nice things. I usually use my tapetry needle (parked off to the side of my stitching somewhere) to loosen a clipped thread a few spaces on each side, then pull with my fingers. It’s very satisfying. Okay, let’s pretend that you were so excited to start and you didn’t have a fray-prevention product at home already, and you didn’t want to run to the store. And you had an oops, and clipped a perle thread. We’ve all been there, it’s okay. In those situations, I use a craft glue that dries clear to actually glue the thread back where it belongs. It works beautifully, but it can cause a little crusty spot where the glue was applied. That’s why I prefer to use the Fray Block before I cut, because it dries clear and doesn’t change the texture of the thread. I’m torn on what to cover next – should I do edging, or weaving/wrapping? Let me know! Ok this is a scary step! I am glad I have fray check and the exact scissors you listed are the ones I bought at Joanns 😉 … But I think I will work more on the Klosters and design before I cut … so that I dont ruin anything…. thankyou for the lesson… I have no idea which lesson I would want to learn next … I actually feel … overwhelmed by the cutting….. BUT not to worry … I definitely want to do it …. YIKES! Thankyou! Okay I started in on cutting last night… It isnt so bad with the scissors I got at JOanns lolI can see, however that I will need to practice before posting a success! I made a small (inch square)“quilt” lol that I may post later …But am hoping with practice today to post something better… I did pick up a hardanger book at 3rd place books – and got it half price…. There are not alot of hardanger patterns out there like cross stitch, so I thought I better get it while I could… It is interesting… I have 2 books in my collection now… thankyou Andrea, I am enjoying this!